Subee is a nickname I’ve had since 10th grade, when I decided to turn out for the Curtis High School tennis team. Our coach, Mr. Webb – a revered biology teacher who used to give extra credit for turning in “mutant” M&M’s® – had a strict policy that everyone on the team have a nickname. My maiden name is Benveniste, so you can see how I quickly became Sue B., or Subee. That's me, front & center with the big hair. Mr. Webb did all kinds of things to make his “tennis ladies” feel special, but one of the highlights was his match day morning ritual. If you were starting in a match that day, you would be “surprised” by a varsity football player interrupting your homeroom class, getting down on one knee and delivering a long-stemmed rose and a kiss (on the cheek). Talk about motivation! 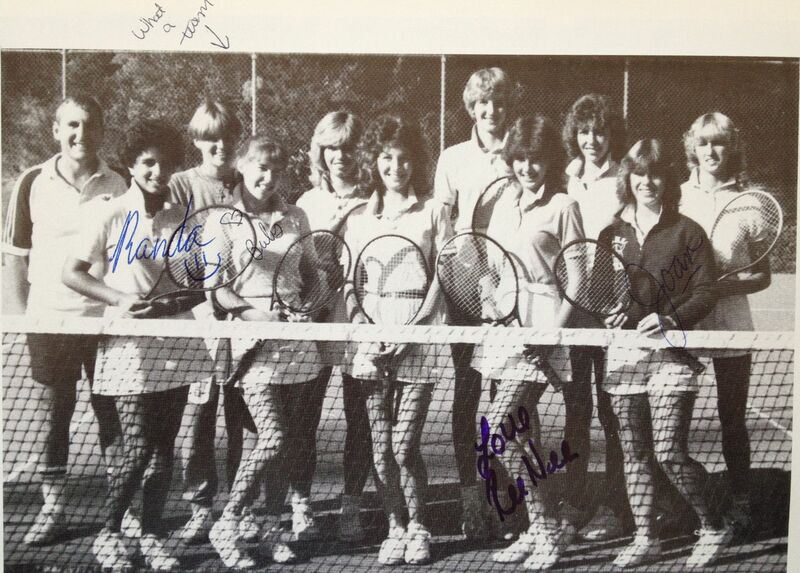 After high school I shelved the tennis racquet (yet oddly kept the big hair and perms going well past college). Last year my love for the sport was rekindled, and with nary a football player in sight. After 8 straight years of childrearing, I think I just needed to get out of the house and do something that didn’t revolve around kids. (Precious as they may be.) Plus, the women on my league teams (indoor winter and outdoor spring) are supportive as well as fun. I think they put up with my less-than-stellar record because I bring tennis ball cookies and good post-match lunches when it’s my turn. Since today was my turn, I broke out the racchette pasta that I found in a grocery store months ago. Normally I make peanut noodles with spaghetti, but I couldn’t resist the racquets for this occasion. 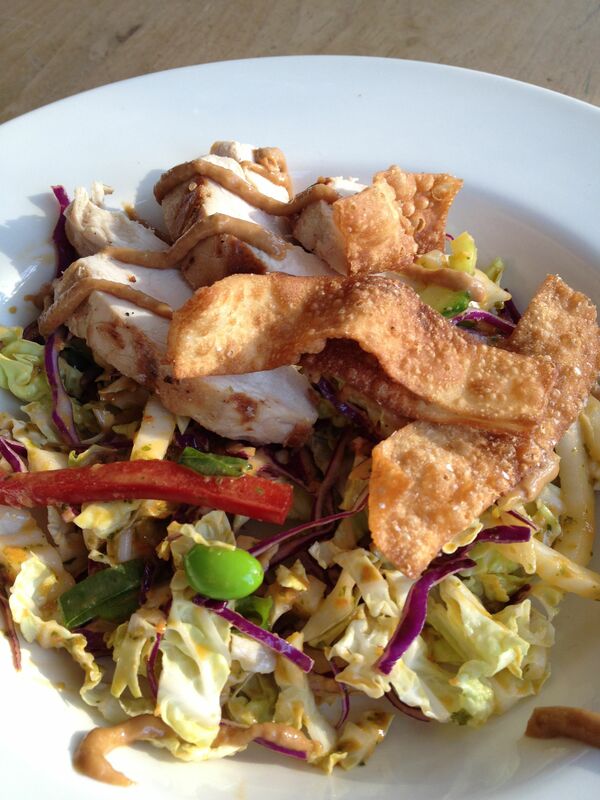 Along with some grilled chicken and a “Thai Crunch” salad, it was an ace of a meal. If only my matches could be as successful! To make all the components for this is a bit of a process (and you’ll feel like your entire pantry is out on your countertop), but a) it’s worth the effort, and b) you don’t have to do everything every time. For example, use shredded rotisserie chicken instead of grilling your own. 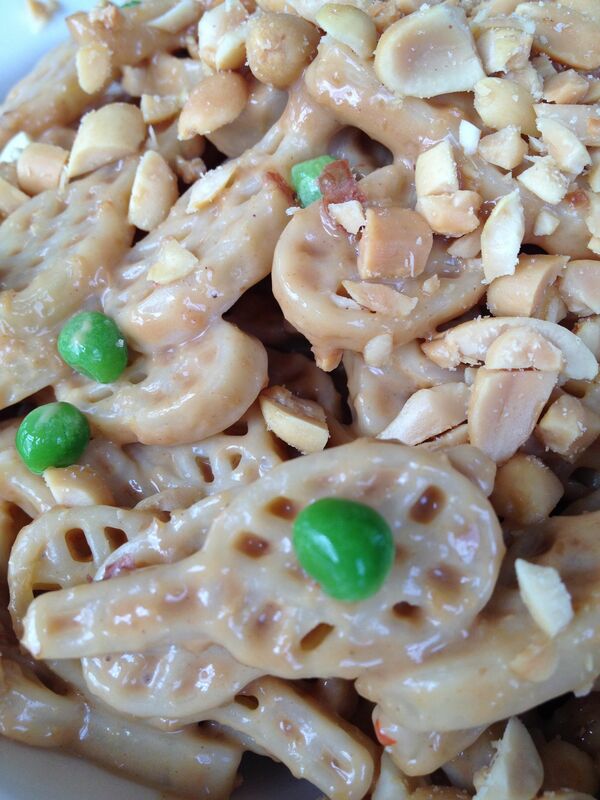 Or use crunchy rice noodles instead of frying wonton strips. (Though the crispy wonton strips are usually everyone’s favorite part, and they’re very quick to make.) Or make only the salad, or only the peanut sauce and noodles. You get the idea. If you’re going to make the marinated chicken, salad dressing and peanut sauce, get out all of the ingredients and try to assembly-line the process since many of the same ingredients are called for. The good news is that everything can be made well in advance and then just assembled prior to serving. (I made everything for today’s lunch yesterday.) And if you have an immersion blender, making the 2 sauces is a snap.